We set out to do good outside of Chillibreeze. We planned to publish comics and other stories that make a difference. 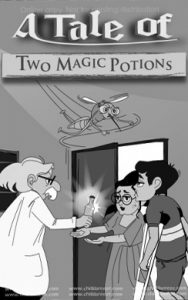 We started with a comic book so that kids in Malaria-prone areas (our area of Northeast India) could learn about Malaria in a fun way. After several attempts at implementing this plan, we stopped. It was too much to sustain. It was outside our core skill area. It might divert our focus away from our customers. We discovered that when we try to do everything we end up mediocre in everything. That message became clear. We have to excel at serving our customers. Mediocrity is not acceptable for a company that must compete, thrive and profit. We have a responsibility to many people who have committed to the success of Chillibreeze. Chillibreeze began to rethink our understanding of corporate social responsibility. We realized that our company is already having a social impact. We are making a difference in the lives of people so we became more dedicated to hiring young people and raising them to be the best they can be. Instead of believing that we had to make a difference by doing a social projects we decide we can make a difference by being the best role model we could be. We set out to prove that a healthy company can do just as much as generous social programs. Through the diligent work of a healthy company we are transforming lives, creating wealth, providing purpose and adding value to customers, employees, families and community. Quality, faithful, diligent, honest work is something that has a value in itself. It is not just a means to an end but something that adds value to many. Minute by minute and task by task work can be a real benefit to many people. Through our work we serve our customers, meet our needs and our family’s financial needs, help our community and earn money to give to others in need. But that is not all. Besides benefiting others, work builds character. It is during work that we learn how to be disciplined, responsible and think beyond ourselves. Our young inexperience employees mature as they work with different opinions and personalities. They discover that to be successful they must learn to work humbly to achieve results. It is the challenges they faced each day that help them be the best they can be. Diligent work clearly benefits everyone. Chillibreeze has successfully brought the nobility of work into perspective. Now we are content that a good company can make a difference. We don’t feel guilty because we are not doing other social initiatives. We believe that one day others will discover that a healthy company is a gift to a community. The Chillibreeze vision is being fulfilled. We believe we are improving the lives of people just as much as any other nonprofit organization. We are excited to be a role model of professionalism in Northeast India. A business that does not show a profit at least equal to its cost of capital is irresponsible; it wastes society’s resources. Economic profit performance is the base without which business cannot discharge any other responsibilities, cannot be a good employer, a good citizen, a good neighbor. But economic performance is not the only responsibility of a business any more than educational performance is the only responsibility of a school or health care the only responsibility of a hospital. Every organization must assume responsibility for its impact on employees, the environment, customers, and whomever and whatever it touches. That is social responsibility. But we also know that society will increasingly look to major organizations, for-profit and nonprofit alike, to tackle major social ills. And there we had better be watchful, because good intentions are not always socially responsible. It is irresponsible for an organization to accept—let alone to pursue—responsibilities that would impede its capacity to perform its main task and mission or to act where it has no competence. When it comes to corporate philanthropy, make sure your company doesn’t take its eye off the ball.